We’ve assembled the following directory of resources for change-makers, nonprofits, activists, social entrepreneurs and political reformers looking to mobilize your cause. Contact us for information about holding a Mobilize Your Cause bootcamp in your town or for your organization. 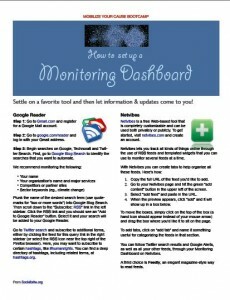 Note: Scroll down to Social bookmarks for a link to see all the sites and tools included in the following presentations. The following handouts are released under a Creative Commons Attribution Noncommercial license — you’re free to republish, remix or redistribute them. See descriptions on our Handouts page. • An amazing collection of free tutorials about how to optimize Facebook, Twitter, your blogs and more. Also see our Videos & Tutorials page. 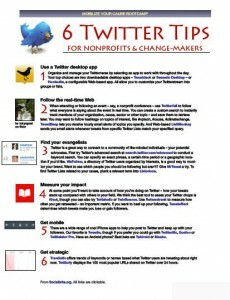 • See the Social Good Lists listing in the right sidebar, including 10 ways geolocation is changing the world, 12 open source tools you should be using and 9 online petition tools.